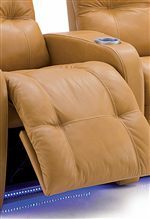 This manufacturer offers infinite-position power recline on all models of recliner. Customized motion means that you can find the position that best suits you, whether you need to soothe back pain or relax and watch TV. This gentle motion is suitable for all levels of mobility, and is as easy to use as a single touch. A back-up battery pack comes standard to help you out of your chair in the event of a power failure. 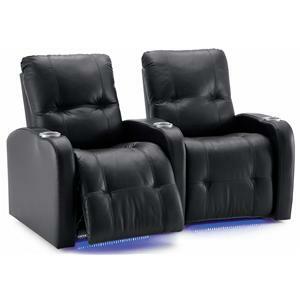 Bring movie magic into your home with this 2-person theater seating. 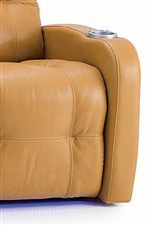 A wedge arm creates a curved form for optimal TV viewing no matter where you sit, while pad-over-chaise seats and button-tufting throughout offer a soft look and feel. 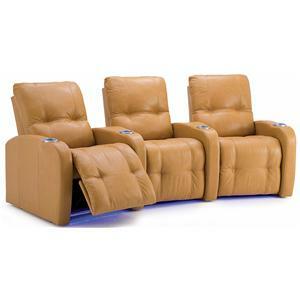 Relax the body and mind with the transitional style and soothing recline of this theater seating group. Built-in cupholders make it easy to enjoy your favorite beverage while lounging. LED lighting available. Available in manual and power recline. The Auxiliary Transitional 2-Person Power Theater Seating with Tufting at Rotmans in the Worcester, Boston, MA, Providence, RI, and New England area. Product availability may vary. Contact us for the most current availability on this product. 41450-6E RHF Arm, LHF Wedge Power 1 40" 40" 42"
41450-2E LHF Arm, Power 1 28" 40" 42"
With transitional style and modern-day accommodations, the Auxiliary collection is perfect for today's home theater. Infused with a mix of contemporary and traditional style, this group features button-tufted chaise style seating for head-to-toe support that is also stylish. In addition, easy-to-use recline mechanisms throughout come with manual or power options, along with LED lighting and built-in arm cupholders. Optional wedge arms create curved sectionals - just what you need for optimal TV viewing no matter where you sit. Settle in for a move marathon or watch the Big Game with family and friends with the Auxiliary home theater group.. The Auxiliary collection is a great option if you are looking for Transitional furniture in the Worcester, Boston, MA, Providence, RI, and New England area. Browse other items in the Auxiliary collection from Rotmans in the Worcester, Boston, MA, Providence, RI, and New England area.